Back in November, The National and Bob’s Burgers gave us something to be thankful for in the form of Matt Berninger crooning “kill, kill, kill, kill the turkey” in the band’s cover of a memorable song from the Fox animated comedy’s Thanksgiving episode. Now the minds behind Bob’s Burgers have extended that concept to create “Bob’s Buskers,” a new web series where musicians—well, their animated counterparts, anyway—set up in front of the Belcher family storefront to perform covers of songs from the show. First up is Official A.V. Club Sweetheart Annie Clark, a.k.a. 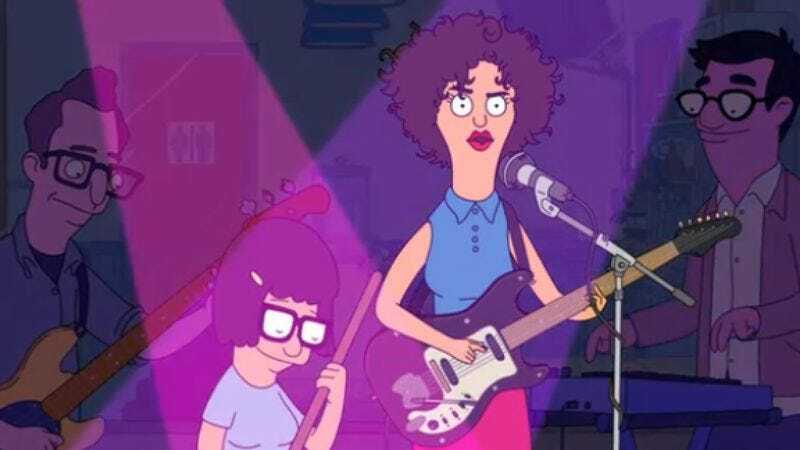 St. Vincent, performing a song from the second-season episode “Bad Tina” (with the eldest Belcher kid herself contributing a sweet air-mop solo). Clark’s fuzzed-out take on the punky ditty is pretty great, though it’s a shame her cartoon self didn’t don Louise’s bunny ears for the occasion.